Go! Stay! Eat! is a 3 DVD set featuring full-length TCR stories about places to see, stay overnight, and grab a bite to eat. This companion guide lists contact information for those stories. As always, we strongly recommend you call ahead before setting off on your own back roads adventure. 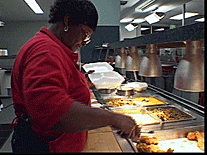 Now called (Ester’s Elegant Eatery) – Find out why they line up at lunchtime in one southeast Texas courthouse. 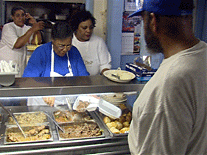 Esther Rollins serves up the best fried chicken you’ve ever had at 2955 Houston Street, Beaumont, TX 77701. Call 409-838-3500 for more information. It’s a great place to enjoy Texas Gulf Coast cuisine while watching international ships navigate their way up the channel. Located at 4406 Battleground, Houston, TX 77057. 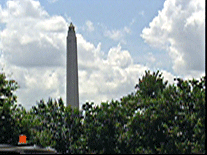 Call 281-479-1521 or visit www.monumentinn.com for more information. Where can you find country cookin’ in the Big City? Vern’s Place, that’s where! Located at 3600 Main Street, Dallas, TX 75226. Call 214-823-0435 for more information. Try the newest fad in fatty foods from the big city of Snook, TX. 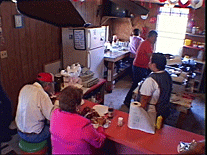 Frank Sodolak operates Sodolak’s Original Country Inn, located just off of Highway 60 West in Snook, TX. Call 979-272-6002 for more information. It’s a mirror image of the old-time soda fountain drugstores. You can even get a malt or shake the old-fashioned way. 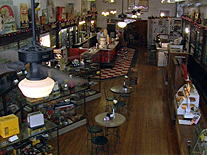 Richard Clare runs the Yellow Rose Drugstore & Antique Mall at 210 East Marshall, Van Alstyne, Texas 75495. Call 903-482-6167 or visit www.collinliving.com/yellowrose for more information. Due to illness, Two Grannies’ is closed. 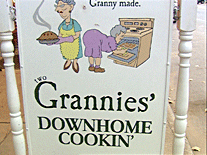 Stop by for some home cookin’ that comes complete with a hug from grannie. 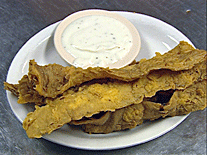 June Thomas and Gloria Whitley will feed you right at 109 West Barnard Street, Glen Rose, TX. Call 254-897-9773 for more information. The search for the best barbeque in Texas leads us to the big city. 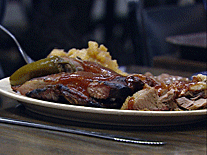 Charles Menasana’s BBQ joint is at 1803 West Mockingbird Lane, Dallas, TX 75235. Call 214-638-7227 for more information. 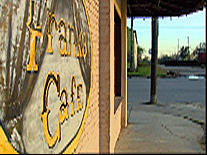 Stop by a roadside South Texas café and find out why folks call this chef “the king”. Trinidad Bermea reigns at Highway 57, Box 383, LaPryor, TX 78872. Call 830-365-4597 for more information. Stop by for a hot meal and a cold drink in the middle of nowhere. 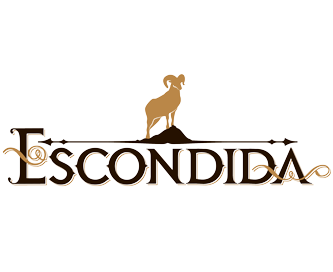 Bobby Gutierrez runs his father’s restaurant at 502 East Galbraith, Hebbronville, TX 78361. Call 361-527-9081 for more information. 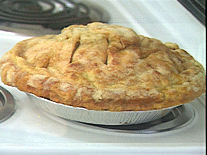 Tootie is known throughout the Hill Country region for her extraordinary pies. She claims it’s her secret recipe. Tootie Feagan runs the Tootie Pie Company at 455 Stringtown Road, Medina, Texas 78055.  Call 830-589-2994 for more information. Backyard dinning in the Texas Hill Country just doesn’t get much better than this. 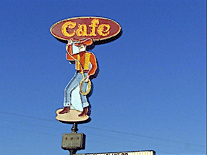 The Nutty Brown Cafe is locate at 12225 Highway 290 West, Cedar Valley, TX. Call 512-301-4648 or visit www.nuttybrown.com for more information. 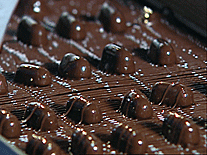 Stop by a hill country factory that’s choc full of sweets for your sweetie. Lecia Duke does chocolate her way at 300 West Main, Fredericksburg, TX 78624. Call 800-842-3382 for more information. 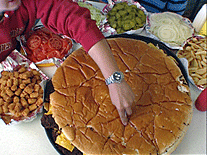 It really, really is…the biggest burger in Texas. Arnold’s Burger will fill you up! And they are located at 1611 South Washington Street, Amarillo, TX 79102. Call 806-372-1741 for more information. Find out how one Texas baker has the donut business cornered. 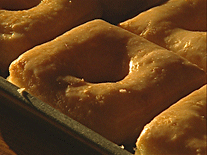 Roger Phillips runs the Donut Shop at 613 West 24th Street, Plainview, TX 79072. Call 806-296-9632 for more information. 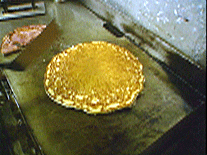 They make manhole-sized pancakes at ‘The City Cafe.’ Folks eat on ’em for weeks and if anybody can eat three, they’re free! 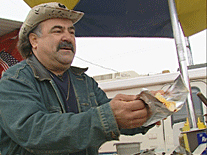 Wesley Turner runs the flapjack shack located in Sterling City, TX. Call 325-378-2029 for more information. Why is this New York City police officer selling hot dogs on the side of the road near Big Spring? Thomas Tafuro will give you all his reasons and a muddy water dog to boot. CLOSED. 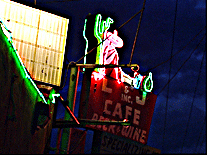 It’s Texas Country Cookin’ at a drive-in called Buddy’s. Bonnie Duncan manages a family tradition at 106 East Broadway, Andrews, TX. Call 915-523-2840 for more information. 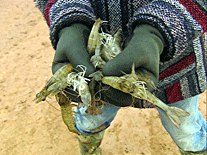 Travel to the middle of the West Texas desert for fresher shrimp than you will find in any restaurant by the sea. Bart Reid runs Permian Sea Shrimp Farms near Imperial, TX. Call 915-536-2216 or visit www.permianseashrimp.com for more information. Find out why El Paso locals are going loco for “The old place by the graveyard.” Leo Duran owns the family business located at 3622 East Missouri Ave, El Paso, TX 79903. Call 915-566-8418 for more information. 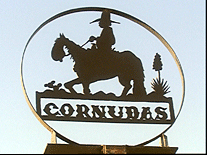 Enjoy the sights, sounds, and tastes of an Old West oasis. Transplanted Texan Dieter Gerzymisch will show you around his Cattleman’s Steakhouse, located near Fabens, TX (30 Miles east of El Paso.) 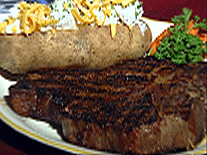 Call 915-544-3200 or visit www.cattlemanssteakhouse.com for more information. It’s a West Texas oasis and it’s the only thing but blacktop and desert for a hundred-and-fifty miles. May Carson runs the Cornudas Cafe located on HC 60 near Salt Flats, TX. Call 915-964-2409 for more information. It’s called the Burnt Biscuit Bakery, a place where coffee and conversation make for a warm welcome in the middle of nowhere. 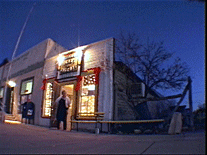 Shirley’s little shop is located at 506 East 1st Street (Highway 90,) Marathon, TX 79842. Call 915-386-9020 for more information. Where else but in Texas can you get a 72oz. steak dinner for FREE. Dine at the Big Texan Steak Ranch, located in Amarillo, TX. 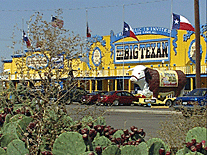 Call 800-657-7177 or visit www.bigtexan.com for more information.